Descubra o centro cultural e o centro marítimo de Greenwich em um passeio a pé de 6 horas e meia incluindo almoço. Embarque no lendário Cutty Sark, visite a casa de Greenwich Mean Time no Greenwich Royal Observatory, visite a recém-renovada Queen's House e visite o National Maritime Museum e o Old Royal Naval College. Procure pechinchas no animado mercado de Greenwich e depois faça um tradicional almoço de pub com vista para o rio Tâmisa. Visite os locais mais famosos de Greenwich, como o Cutty Sark, o Greenwich Royal Observatory, o National Maritime Museum, o Old Royal Naval College e o Greenwich Market. This was a great day. Our guide Stephen was very knowledgeable and friendly. He kept the tour moving at a pace that accommodated everyone on this tour. It was just our family and with our 11-year-old daughter and another couple. The museum was very interesting and we hit the highlights. Our favorite part was the royal observatory and standing on the prime meridian. The Cutty Sark was also well done. The pub at lunch was at an old pub right on the water. It was a very good eye and a very quaint place. We took the public ferry to Greenwich from Westminster Bridge. This was a very nice way to travel and to Greenwich Avenue. You get a nice view of the sites along the river. We would highly recommend this tour! Our guide Stephen was passionate about Greenwich and his knowledge especially in the observatory outstanding. Apart from a slight hiccup with the lunch, all ran smoothly. Our guide Stephen was just wonderful. Great knowledge which we so enjoyed. Would certainly recommend Greenwich Royal Tours to friends and family! There were only the two of us doing this tour, so we had individual attention from our guide, Graham. It was very interesting and informative. We toured the Cutty Sark, saw the Queens House, had lunch at a pub on the Thames and went on to the Observatory. Great to see all the navigation instruments and clocks and hear their history. A fairly brisk paced tour, we probably would have liked a little more time in the Maritime Museum.
" We enjoyed a wonderful combination of sights, history and walking - and lunch - on the Best of Greenwich Tour. Our guide was able to give us a balance of information, humour and a passion for this history of Greenwich. 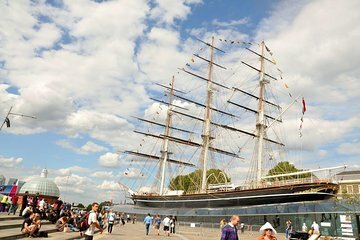 We highly recommend this tour for couples and families, as a way to experience the best of Greenwich in a day" ! The best part of this tour was that no one else showed up for it. So it was just me and a highly knowledgeable local expert that spent the day together. He was quite friendly, pretty funny and really cared about what I wanted to see and do. We had a great lunch in a proper pub right on the Thames. And we had some good pints to boot. If you want to visit Greenwich and you are not an expert, this is my recommended way to do it. I took several hundreds of photographs and the tour guide helped me set up many of my shots. Unfortunately, my computer crashed after I had gotten home and I didn't back them up. I'm so sorry I can't share them with you all. This tour was excellent despite the inclement weather. Our guide, Steven, was very passionate and knowledgeable and showed some flexibility in dealing with some unforeseen challenges. Greenwich is a delightful place with a wealth of history. We thoroughly recommend this tour.